Established in 1899, Van Briggle Pottery & Tile is one of the oldest active art potteries in the United States, and has been considered one of the great American potteries for over a century. The Van Briggle studios produce the early designs of its founders, Artus and Anne Van Briggle, as well as pieces created over the years that compliment their celebrated style, in a variety of colors -- both historic and contemporary. 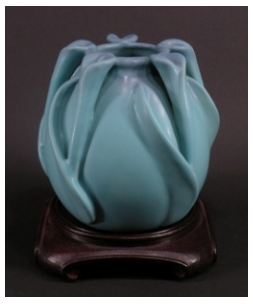 Height: 6.5" Opening Diameter: 2.5"